Armchair Fiction presents fully illustrated extra large editions of classic science fiction double novels. “Daughter of Thor” is an exciting adventure classic by one of sci-fi’s most beloved authors, Edmond Hamilton. During the Nazi invasion of Norway, American fighter pilot Mart Fallon found himself on the receiving end in an air duel with German flying ace, Victor Heysing. As Fallon hurtled toward earth, he knew his life was about to come to a violent, bloody end. But amazingly, not only did he survive the crash, but he discovered he was marooned in a lost land of gods and magic. Before long he was walking through time-trodden streets surrounded by ancient buildings and mighty temples; it was the lost city of ancient dreams—Asgard, home of the gods! Asgard’s leader was a woman of indescribable beauty, a creature with powers mightier than all the weapons of war. Her name was Brynhild—daughter of Thor. Mart Fallon was captivated by this living goddess, and she by him. But when his German nemesis, Victor Heysing appeared, Fallon knew the fate of the world was in the hands of a woman who must now decide to use her powers for ultimate good…or ultimate evil. 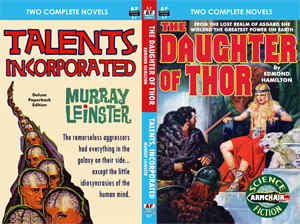 This edition’s second novel is “Talents, Incorporated” by another sci-fi wizard, Murray Leinster. At best, the tiny Kandarian Air Fleet would fight until its last ship was blown into infinity. At worst, it would be annihilated without a chance. To young Captain Bors, either course was unthinkable. However, the ruthless Dictator of Mekin had already subjugated twenty-two helpless planets. Now he wanted Kandar's unconditional surrender, or his vastly superior forces would blast it out of existence. It took a lot of guts, and the hope that is frequently born of despair, for a military man like Bors to throw in his lot with “Talents, Incorporated,” an untried, unscientific organization. Through peculiar gifts of extra-sensory perception, its personnel could, their leader insisted, out-think and out-guess even the most deadly dictator in the history of mankind. Could it? It just might. And it just might not… But there was absolutely nothing to lose, and a free world (and a beautiful girl) to win. Captain Bors made his decision, and the loaded die was cast!